I’ve recently had to go through the process of restoring a series of OU objects which is not at all fun even with the AD Recycle Bin feature that came along with Windows Server 2008 R2. It’s easy to make mistakes though but most can be averted with the ‘Protect Object from Accidental Deletion’ flag. In order to toggle this value in the ADUC console select View > Advanced Features. Once selected the object tab is available which allows you to toggle the object. Any OUs in the University Active Directory that have been created using the Server 2008/Vista or later AD tools will have the value set by default. Other objects such as users and computers do not get the value automatically. REMEMBER TO TEST YOUR SCRIPT FIRST! 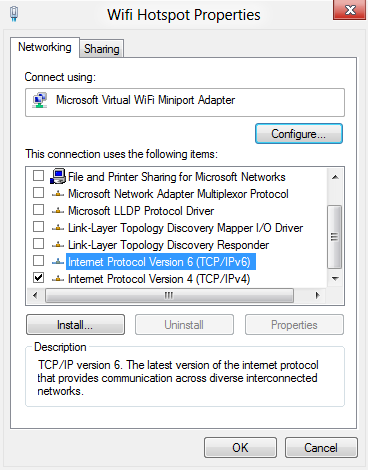 Share an Internet connection and turn a Windows 7 or 8 PC in to a Wireless Hotspot (even on a VPN)! I recently needed to connect my phone to a wireless network and the only connectivity available was a wired VPN on my notebook. It turns out that in Windows 7 and Windows 8 it is possible to turn a wireless enabled machine into a hotspot that any device can use! Where <networkname> is your choice of name for your Hotspot and <password>is a strong secure password. 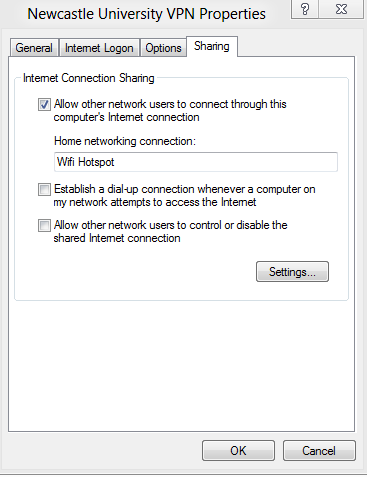 netsh wlan set hostednetwork mode=allow ssid="James WiFi" key="G0dBl3ssTheIntern3t"
4) Browse to the properties of the Internet connected adapter or VPN connection and select the sharing tab. Tick the first box as below and select Wifi Hotspot as the Home n.
To remove the settings run the command below and do change the WiFi Hotspot name or password just run the first command again with the new details. I recently accidently set added Authenticated Users = Deny Read on GPO object. As ‘Deny’ ACEs take priority over ‘Allow’ everyone was blocked including Domain and Enterprise Administrators! After some research, trial and error we found that the following procedure can be used to restore permissions back to Domain Administrators. 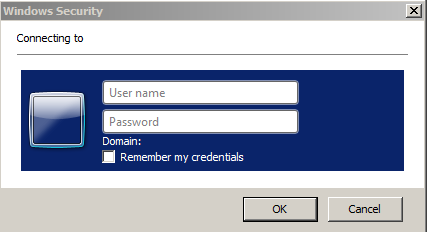 Log on the PDC emulator as Domain Admin. Locate the system object in the AD. GPOs are in the System Container. Restore permissions for the object. Check the object’s folder within SYSVOL and verify the permissions are up to date. If not then restore the permissions here too (I actually did this between 5 and 6 but according to Internet sources step 7 will do this). We’ve recently been asked how we dispose of our hard disk drives/tapes while ensuring that sensitive data is protected. Depending on the nature of the data we use a 2 stage method. Darik’s Boot and Nuke (“DBAN”) is a self-contained boot disk that securely wipes the hard disks of most computers. DBAN will automatically and completely delete the contents of any hard disk that it can detect, which makes it an appropriate utility for bulk or emergency data destruction. DBAN is a means of ensuring due diligence in computer recycling, a way of preventing identity theft if you want to sell a computer, and a good way to totally clean a Microsoft Windows installation of viruses and spyware. Tapes are erased using the built in library features. Completing this stage would make media suitable for internal transfer and reuse within the University. In order to use DBAN yourself you simply need to burn a copy of the ISO which creates a bootable CD/DVD. After that simply follow the on screen instructions. If the media holding the data is to be disposed of or recycled the University has a contract for WEEE contractor- www.secondbyteit.co.uk. Second Byte provide Hard drive erasure and Certificates of data destruction. Each piece of equipment is given a reference by the contractor and certificates of destruction are provided. These are stored electronically centrally. Hard drives are removed from machines during booking in, placed in secure containers and moved to a separate area of their warehouse. Only specific members of staff are allowed to handle hard drives. All hard drives are sanitized again using DBAN working to DOD 5220.22-M with 7 passes even if clients have sanitized them or if they have asked for disposal. All hard drives that clients have asked to be destroyed are recycled after being sanitized. Any tapes or other media are physically destroyed certificates of destruction provided. There is now updated information security guidance on the ISS web site. A web link is also provided to the University’s Information Security Policy. This guidance is aimed at all users of ICT across the University. More technical guidance for ICT personnel will be published in the near future and will be based on the feedback received through the planned Information Security Workshops. The workshops will take place in Claremont Tower, room 701. Please see the attachment for more information. Thought I would blog on something that I only learnt last year but has been a great time saver for me. Also, several files types have other contact sensitive options for instance Office files can ‘Open as read only’.